SQL WHERE clause acts as a filter to the SQL statements. If the SQL statement is a SELECT query then it fetches those rows which satisfy the conditions in the WHERE clause. Let us say we want to delete all employees from employee table who are fired. We will tell the SQL based database to delete some specific rows out of all the rows in the table. We specify those with the help of filters or WHERE clause. I know how you are feeling. Enough theory !!  Let us see SQL WHERE clause syntax with some examples in this SQL Tutorial.  Let’s get started with  SQL WHERE. Before that please go through the SQL Tables, Statements. The SQL WHERE comes after the table_name in the SELECT clause. It is also applicable to the UPDATE, DELETE statements. The WHERE clause comes at the end of the query. It has a certain condition or a bunch of conditions resulting in a conditional expression. Oracle selects only those rows who satisfy the condition. Please note that we have used two single quotes around the string. That is how Oracle understands the data is a VARCHAR2 or STRING. When we try to find out the jobs from the jobs table which are having min_salary greater than 5000, we will use the greater than symbol. 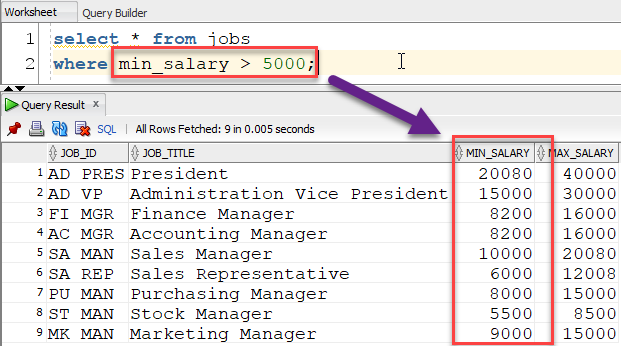 So, the query is SELECT * FROM jobs WHERE min_salary > 5000. Here, min_salary > 5000 is the condition. Only those rows are fetched who satisfy the same condition. You can see in the figure that the min_salary column values are greater than 5000.